Hever Castle is one of those places you go to for the history, which seems a daft thing to say about a castle but the fact that King Henry the Eighth courted Anne Boleyn, the glamorous girl with the extra finger, there has a strong fascination for the place. Like many ancient buildings though the original family fell on hard times and it passed into the hands of a more wealthy and American bunch, the Astors. Once you get there the topiarist is knocked out by the single yew specimens on the walk up to the main drawbridge but there is more, much more to the gardens beyond. 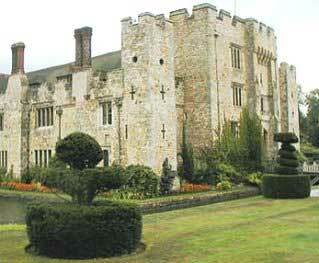 W.W. Astor the American millionaire bought the property at the beginning of the Twentieth Century and set about buying topiary from amongst others, William Cutbush of London to populate the Anne Boleyn Garden. 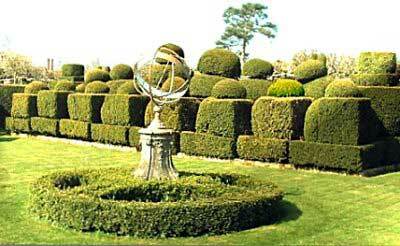 He then set about creating the old English garden with its yew chess set modelled on figures in the British museum. There is an Italian garden further back which was all the rage in 1904 and which contains a liberal smattering of some of Astor’s Italianate statuary and some beautiful pools, but for the topiarist there’s the immaculate yew maze between the Italian gardens and the castle and mock tudor village designed for Astor’s visitors. The maze was laid out in 1905 and is 75 feet square although some maze purists think its symmetry makes it too easy to find your way to the centre. If like me you go to Hever expecting a glorious castle with a few topiary specimens then you will be wonderfully surprised to see the extensive gardens and other topiary and perhaps, if its a dry summer, attempt the maze for yourself.